Happy Thursday friends! We've almost officially made it through the first full week of 2016. How's everyone feeling so far? Our weather has been up and down this week which has me all kinds of confused. We started out pretty chilly (especially compared to what it was the week of Christmas) and now we're back up in the 70's but off and on rainy. Kinda crazy and definitely hard to plan for. Luckily my Hunter boots are perfect for this kind of weather! Since I get up pretty early and it's usually still pretty cool out I've been trying to layer so prepare for the weather. This striped tee is perfect for layering under a sweater or a jacket when it's cooler and by itself when it warms up. I decided to mix stripes and plaid by throwing on my plaid blanket scarf to keep cozy and my favorite floppy hat to keep the rain showers out of my face. 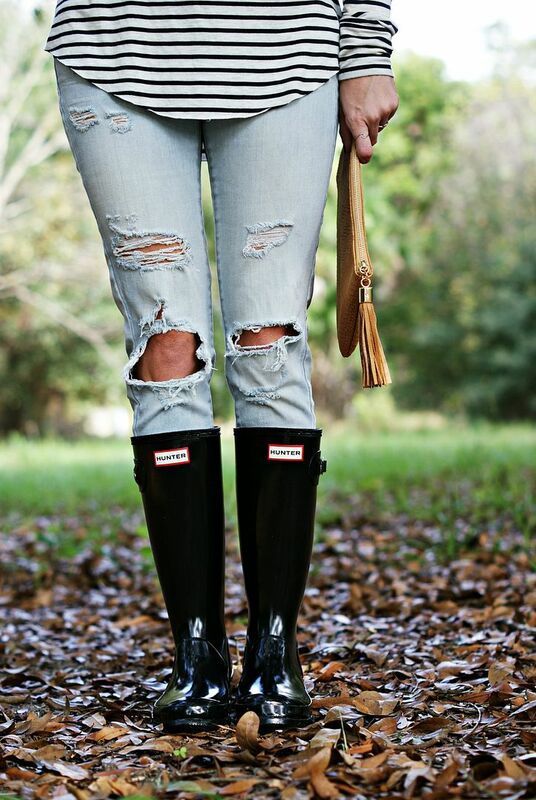 Of course any rainy/snowy day calls for Hunter boots to top off your look! This combo is so cute, I love it with the distressed denim! Thanks for the hunter boot sizing secret!! What a great tip to know! I definitely didn't know the Hunter boots secret! I've worn this combination a bunch this year, either with the long tunic that I have or the shorter version similar to what you're wearing here, that I got from Loft. The blanket scarf goes so well and adds that Fall/Winter touch! Love your hat!!! I just got a few hats myself and I am kind of obsessed. Love your print mixing too! Stripes and plaid, two of my faves. You are rocking this look flawlessly, lady! One of my all-time favorite looks - stripes mixed with another pattern. You look fab! Love this look! 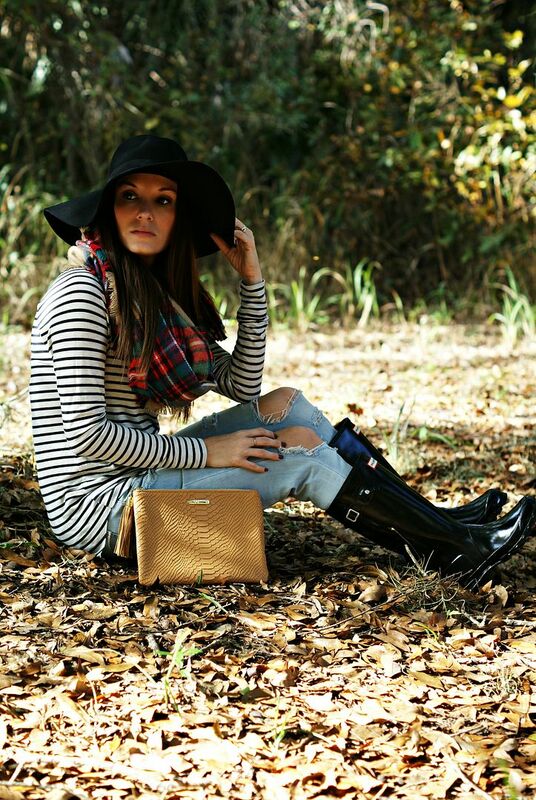 Stripes and blanket scarves and hunter boots go perfectly together! And I had no idea about the Hunter kids sizes, I'll definitely have to keep that in mind for when I decide to buy another pair! You know how I feel about stripes and plaid! One of my favorite combos. Great shots girl! Plaid and stripes, my favorite combo!! I can't believe how warm it was there the week of Christmas, I'm shivering in the Carolinas now! i love us as hunter twins hehe. and i totally buy kids shoes sometimes! it's the best. makes me feel a little better about my mildly larger feet haha. i love that shirt btw and feel like i need! you're rocking this look! That is the best secret ever! I can't believe even my big old feet would fit into kids!! That's so brilliant! You look stunning! This hat is absolute perfection on you! 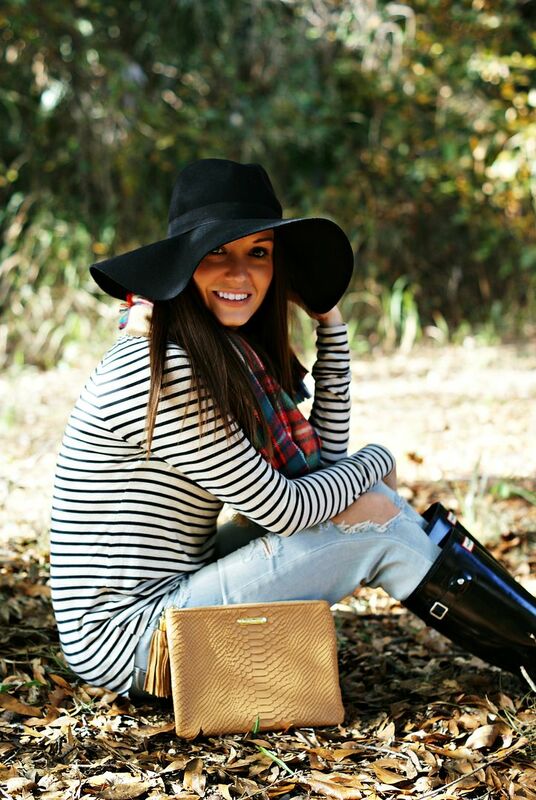 Loving the stripes and plaid combo! So cute! Such a great idea about the hunters! I actually thought of that but wasn't sure if they would be tall enough but I ended up finding them on major sale with no tax or shipping so they were like 2$ more haha! I was pretty excited haha! Stripes and plaid = my fave combo. Also, I've seen Hunters on sale at Costco for about $80. This is such a great outfit! & um, what an awesome tip about the kids hunter boots vs the adult ones. I will definitely be looking into that! I will not let another rainy football season catch me off guard again! Oh man, I wish that I had known that about the Hunter boots kids sizes! I love the way that you mixed the patterns, but also made one of them pop with the color in the scarf. Your hat is so pretty too! 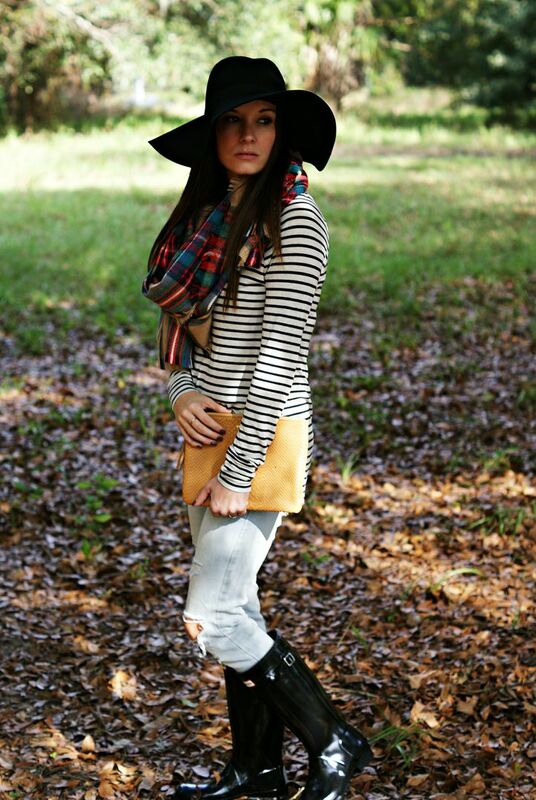 Stripes with plaid is such a great combo! The boots are great too! 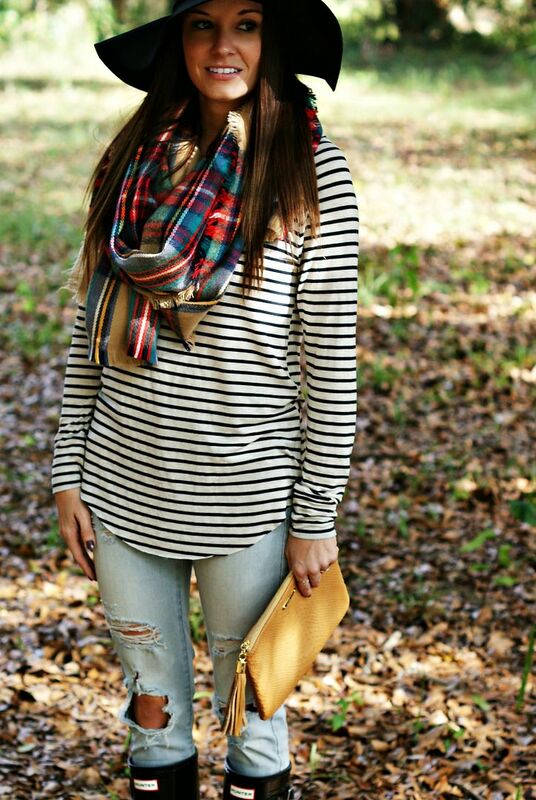 Mixing stripes and plaid is pretty much my favorite- looking adorable girl! Mixing stripes with plaid/leopard/floral is my favorite! Also that's amazing about the Hunters. I wish I didn't have giant feet so I could take advantage! 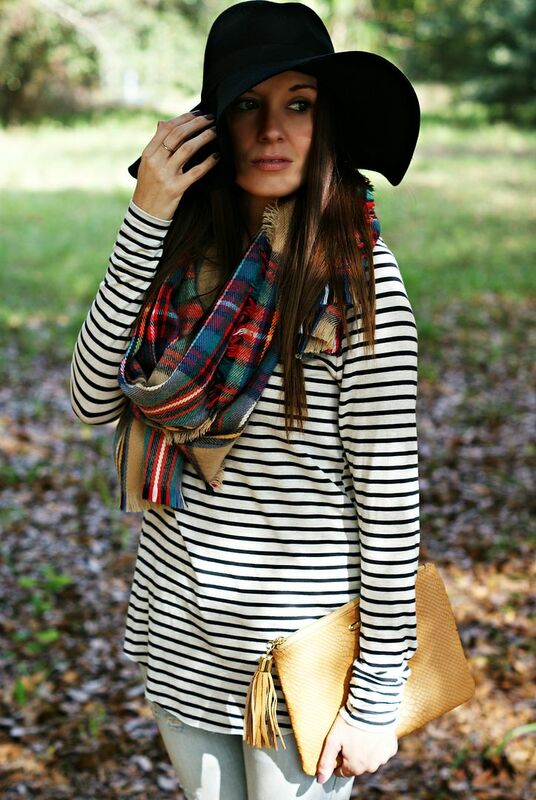 I love how stripes look on you and the color of the purse ties the scarf in nicely to the whole outfit. Super cute and comfy! This is such a cute look! Stripes and plaid is one of my favorite combos! Love that floppy hat! i love that you are wearing kids hunters! i totally tried to find some, but my calves are abnormally large haha plus they were super short. but if i were shorter i would be all about the kids ones! i'm trying to convince my short friend to look at kids ones, she doesn't believe me! You seriously could not look more gorgeous! Isn't that tunic from Nordstrom the best? I'd wear mine everyday if I could. Love that you were able to finally wear some winter clothes down by you! Love the look! I had no clue about Hunter boots...I am definitely going to remember that if I purchase another pair! love this outfit! one of my faves. and thanks for the tip about hunters! i had no idea!! Great outfit... I adore stripes!